Our friendly demeanor, attention to detail, and quality results have earned us a reputation as the best choice for hauling and junk removal services throughout Burbank, Glendale, Pasadena, and surrounding cities. We provide free over-the-phone and on-site estimates. We hauled away this pile of wood from a home in Alhambra, CA. Our client tore down their backyard fence and needed help hauling and disposing of the old materials. We arrived on-site and quickly loaded the truck and swept up the area leaving it clean and junk-free. At R&G Hauling, our trucks are clean and well-maintained so our customers never have to worry about oil leaking onto their driveway or any debris flying out of truck bed. 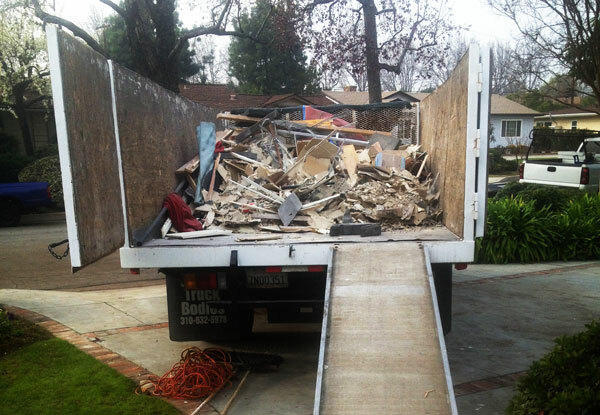 We offer competitively-priced hauling and junk removal services throughout the Pasadena and Monrovia area. Our junk removal services include hauling away unwanted furniture, appliances, construction materials, yard waste, and more. 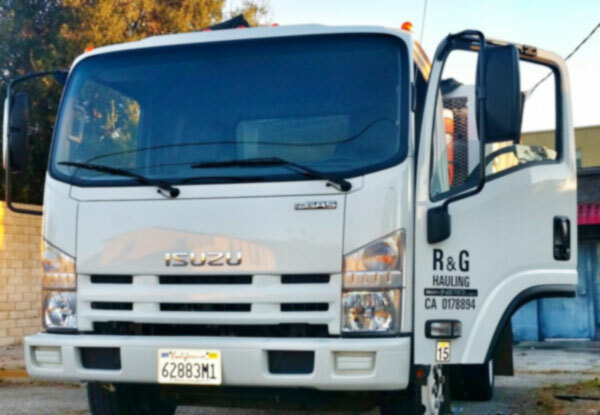 R&G Hauling provides thorough construction cleanup and hauling services throughout El Monte, Alhambra, Altadena, and surrounding Pasadena area cities. We also provide non-structural demolition including ripping up carpets, tearing down cabinets, breaking down fences, removing countertops, and more. Once the demo is complete we haul away all the broken materials and sweep up any leftover dirt and debris. 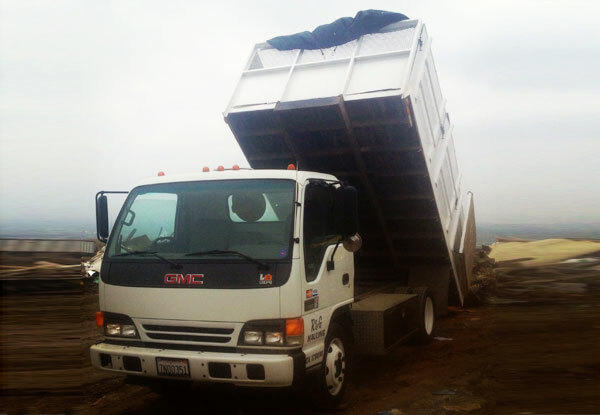 Thousands of satisfied clients have relied on R&G Hauling for construction waste removal services throughout the San Gabriel Valley. Our competitive rates and commitment to customer service have earned us a reputation as the best value for hauling and junk removal in Pasadena and nearby cities. Every year we haul away thousands of pounds of furniture, appliances, construction materials, and more. For over 20 years, R&G Hauling has been Pasadena and Monrovia’s go-to source for yard cleanup and green waste disposal. We remove tree branches, leaves, and other yard waste including broken fences, patios, and more. Our service is fast, convenient, and hassle-free. 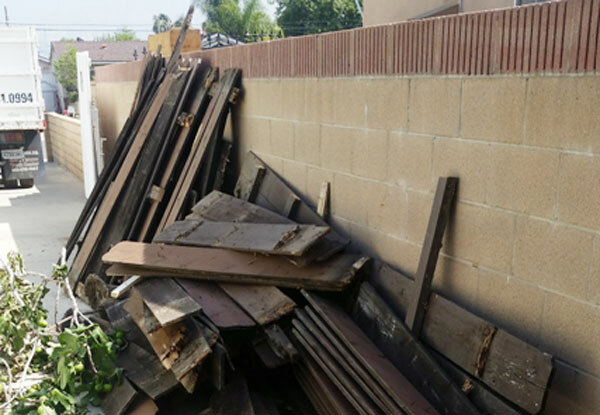 Our client asked us to remove several hundred pounds of broken down construction materials from the side of their home in Duarte, CA. We hauled away all of the junk and swept the area after loading our truck to remove any leftover dirt and debris. We hauled away this unwanted furniture from a home in Monrovia, CA. Our furniture removal services are affordable and reliable. We can haul away beds, mattresses, couches, refrigerators, exercise equipment, and more. Call us today for a free consultation for furniture & appliance removal throughout the Pasadena and Monrovia area. 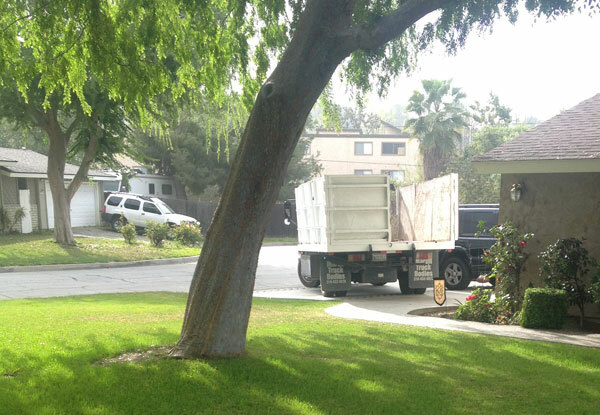 R&G Hauling offers convenient furniture removal services throughout the Pasadena area. We removed a couch, several mattresses, and a bed frame from this Glendale residence. We haul away your old furniture from anywhere on your property, making the process as easy as possible for our customers. 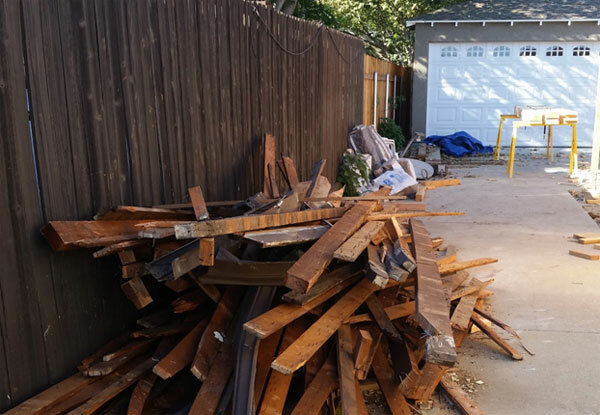 We removed this pile of wood and construction materials from a home in Arcadia, CA. Our client called us to haul away this stack of wood following a remodel project in their home. When you hire R&G Hauling we always arrive on-site with enough guys to complete the job in an efficient manner. At R&G Hauling, customer satisfaction is our top priority. We arrive on-time, work efficiently, and clean up the area after loading our truck. We haul away unwanted items from anywhere on your property including upstairs, in the basement or attic, or in the back of your garage. Our customers are never required to haul things to the curb. 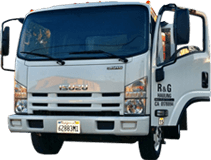 R&G Hauling offers reliable and affordable hauling & junk removal services to Glendora, Arcadia, Azusa, El Monte, and nearby Pasadena area residents. We provide hauling services for jobs of all sizes. Text us a picture of the stuff you want removed, or call us to discuss your hauling needs and receive a free estimate. We removed and hauled away this stack of junk for a Burbank client. When you hire R&G Hauling you can be assured that you’ll receive friendly, prompt service and thorough yet efficient results. We always sweep up the area after loading our truck and will even hose down the area upon request. In addition to hauling and junk removal, we also offer assistance with non-structural demolition projects. We help our clients tear down cabinets, rip up carpet, breakup tile floors, knock down drywall, and more. After the demo is complete, we haul away all old building materials and related fixtures. We completed this wood floor removal in Glendale, CA. Our client needed help tearing up their old flooring in preparation for remodeling their home. We hauled away the old flooring materials and swept up all leftover dirt and wood chips so the homeowners could lay the new flooring without any inconveniences. Since 1993, R&G Hauling has provided junk removal services to thousands of satisfied clients. We arrive on-time and treat our customer’s and their property with respect. Our goal is to make the process as easy and convenient as possible. This Glendora resident called R&G Hauling to remove these unwanted household items from their yard. Thousands of residents throughout the San Gabriel Valley have turned to R&G Hauling for their junk and trash removal needs since 1993. Our team worked efficiently to load and haul away these boxes and other unwanted items from a home in Rosemead, CA. After reviewing several hauling companies, I decide to send a quote request through Yelp. I have had mixed results using the "messaging" service on Yelp because many businesses have ignored my requests; however, Rob answered my message within an hour, which from my experience on Yelp is a good sign. I am glad that I chose this company to get help hauling away my old furniture. Rob was professional and personable. Can't recommend him enough!